Put your embroidery machine to work making a functional piece of fiber art. This Free Form Place Mat can be part of you table setting or used as a hot pad for the dinner table. Learn how to make this ITH (In the Hoop) Machine Embroidered Place Mat by Sweet Pea as part of our ITH Club. 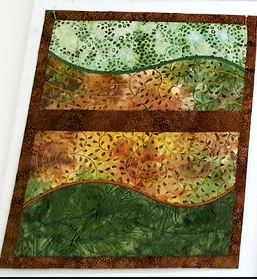 You will learn to embroider, assemble and complete the place mat – including: shortcuts from the instructor and suggestions for tweaks to the original design. 50 weight sewing thread preferred, but any cotton thread will work.